While Bangkok itself covers a massive area, most expats choose to live in a few areas close to the centre of town. Expat neighbourhoods tend to be located on the BTS or MRT network and near major shopping malls and entertainment areas. Below, we’ve covered all of the areas in Bangkok that are of interest to expats, as well as a few that are off the usual expat trail. For each area, we’ve included a summary of the pros and cons you can expect if you rent a condo or apartment there, from costs to noise, traffic and more. Sukhumvit Rd is a long arterial road that runs east-to-west through the center of Bangkok before extending into neighbouring provinces. 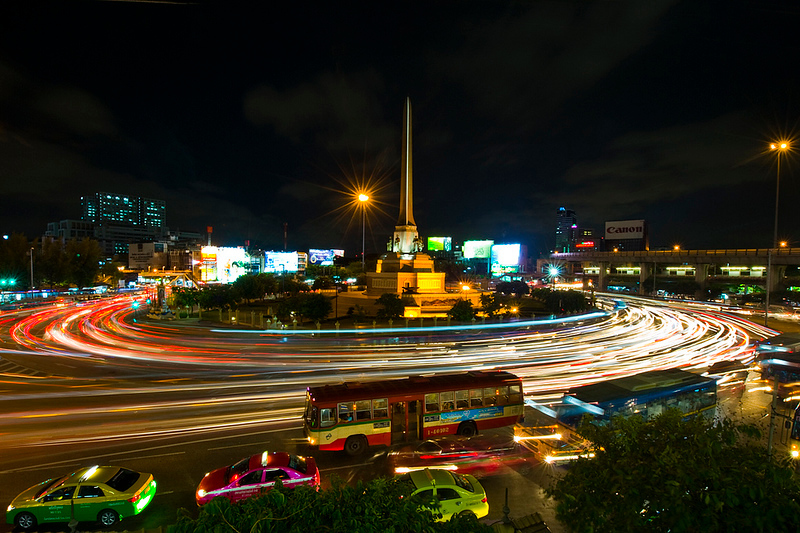 The central part of Sukhumvit Road runs through several of Bangkok’s most popular residential areas for expats. Because the Sukhumvit area is served by its own BTS line, it’s one of the most convenient parts of Bangkok for public transportation. All of the neighbourhoods listed below have good access to the BTS Skytrain, making it easy to get to most parts of Bangkok without getting stuck in traffic. Lower Sukhumvit is the area between Nana and Asoke BTS stations. It begins at Sukhumvit Soi 1 and ends around Sukhumvit Soi 23, after which the area becomes Upper Sukhumvit. For the most part, Lower Sukhumvit is a red light district and nightlife hotspot, particularly in the area close to Nana BTS station. Expect a lot of noise and activity in this area late at night. As a result, this isn’t a great place for families to live. From Soi 19 onwards, the red light district aspect of the area begins to die down slightly and the convenience aspect becomes more obvious. Lower Sukhumvit is where you’ll find the Asok BTS/Sukhumvit MRT interchange, which provides access to most of the city via public transportation. It’s also home to Terminal 21 mall, which has a supermarket, cinema and a good selection of clothing stores and restaurants. Overall, Lower Sukhumvit is worth considering if you can tolerate being located near Bangkok’s main red light districts, as rents here tend to be quite affordable compared to the more upmarket Upper Sukhumvit area nearby. The area from Sukhumvit Soi 23 to Ekkamai BTS station is known as Upper Sukhumvit. One of Bangkok’s most desirable places to live, Upper Sukhumvit is home to a great selection of luxury condos, with several shopping malls and some of the city’s best restaurants and bars. Compared to Lower Sukhumvit, Upper Sukhumvit is substantially cleaner, quieter and generally nicer as a place to live. Upper Sukhumvit is a favourite area of wealthy Thais, largely due to its quieter, more relaxed atmosphere than other parts of Bangkok’s centre. Because Upper Sukhumvit is a major residential area for moneyed locals and foreigners, this is where you’ll find most of Bangkok’s luxury condos and apartments. Rents in this area are more expensive than in neighbouring low Sukhumvit, usually by something in the range of 15 to 25%. Upper Sukhumvit also has by far Bangkok’s best selection of international restaurants, bars and cafés. The area around Phrom Phong and Thong Lo BTS stations is home to hundreds of great places to eat and drink, albeit mostly at a premium price. If you’re a young professional earning at least 75,000 baht per month, this is probably the part of Bangkok you’ll want to live in. Just be aware that rents in this area are substantially higher than in other parts of Bangkok, particularly less “discovered” neighbourhoods off the BTS. After running eastward throughout the centre of Bangkok, Sukhumvit Road turns south. The far central section of Sukhumvit Road runs through areas like Phra Khanong, On Nut, Bang Chak and Punnawithi that are home to some of Bangkok’s best value condos and apartments. On Nut has long been a favourite of English teachers and other expats living in Bangkok on a tight budget. Although it’s getting more developed and expensive every year, it’s still one of the cheapest neighbourhoods located less than 15 minutes from Bangkok’s main centre. Because this area is served by the BTS Skytrain, it’s very easy to get around. It’s also home to several markets, malls and supermarkets, from the large Tesco Lotus hypermarket at On Nut BTS station to the newer W District outdoor market near Phra Khanong BTS. From a cost of living perspective, the Phra Khanong/On Nut area offers the best value you’ll find along the Sukhumvit Line. Apartments here are cheap, reasonably spacious and fairly new due to the ongoing construction boom in the area. The only real downside of this area is the lack of international dining and nightlife, although this is easy to find a 10 to 15 minute taxi ride away in Upper Sukhumvit. Silom, which covers the area around Silom Road, is Bangkok’s main financial district and home to most of its corporate offices. This area is a fast-paced business district during the day and a popular nightlife area at night, with a variety of sky bars and one of Bangkok’s seediest streets. As a place to live, Silom offers a variety of options, from some of the Bangkok’s most luxurious condos to surprisingly cheap apartments. Because of Silom’s density and high real estate prices, most accommodation in this area is of the high-rise condominium variety. Along Sathorn Road and in the small sois that extend off of Silom Road, you’ll find a good selection of mid-sized and large condos. Because this area is a business district, condos tend to be on the expensive side, with executive styling and other features that appeal to corporate, expensive package types. For the most part, prices are similar to what you’d pay for the same type of accommodation in Upper Sukhumvit. The Silom area is very well connected to public transportation, with BTS stations at Sala Daeng and Chong Nonsi, as well as MRT stations at Lumpini and Si Lom. Be aware that this area can get very congested during the morning and evening rush hour due to commuters. Siam is Bangkok’s retail hub, home to more shopping malls than most people could visit in an entire lifetime. It’s also where you’ll find several upmarket residential areas, most of which are located around Chit Lom and Ratchadamri BTS stations. Condos in the Siam/Ratchaprasong area tend to be luxurious and expensive. 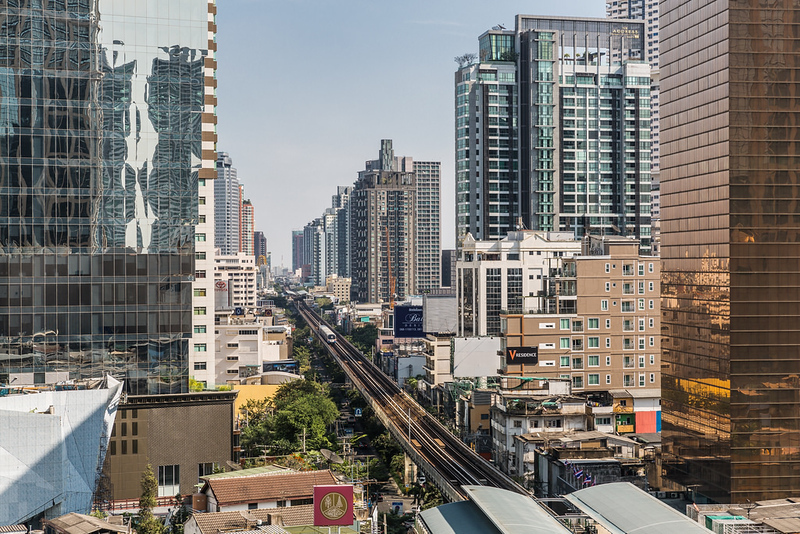 The area around Ratchaprasong BTS station, in particular, is home to some of Bangkok’s most expensive condo developments, many of which are priced at more than 50,000 baht per month. If your budget allows, this is a pleasant place to live. Although it’s busy during the day, the lack of nightlife means the Siam/Ratchaprasong area is calm and convenient at nighttime, making it a nice alternative to noisy Lower Sukhumvit a few stations away. 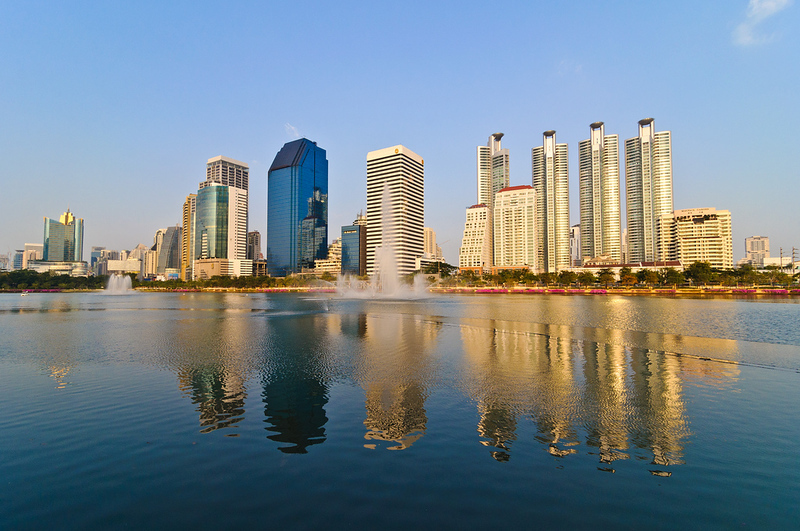 Northern Bangkok is home to several good neighbourhoods for expats, many of which are more affordable than similar areas along Sukhumvit Road. If you want to live in a convenient, centrally located area, you’ll find several neighbourhoods of interest in Northern Bangkok. The Phayathai/Ratchathewi area is a great option if you want to live close to Bangkok’s retail shopping hub in Siam but away from the hustle, bustle and high prices. This area has several mid-priced condo developments, most of which are within walking distance of the BTS. The area around Victory Monument is one of the best places in Bangkok for low-cost, highly convenient condos and apartments. Rooms here are substantially cheaper than in Phayathai but are still just 10-15 minutes away from Siam using the BTS Skytrain. Victory Monument is also a major shopping and dining hub, with a great selection of cafés and restaurants on small streets like Soi Rangnam. One of Bangkok’s hipster neighbourhoods, Ari is home to a great selection of cafés, restuarants and bars. It’s also a great mid-priced neighbourhood for expats, with a selection of condos in the 20,000 to 35,000 baht range that’s unmatched by other areas in North Bangkok. Ari is served by its own BTS Skytrain station, with an American-style strip mall and international supermarket located within walking distance. If you can tolerate being 20-25 minutes away from Siam and Bangkok’s other commercial areas, you can find some great bargains on apartments, houses and condos in the Chatuchak/Mo Chit area. With Chatuchak Park and the famous weekend market nearby, this area is a convenient place to live. It’s also the location of numerous affordable condo developments, with plenty of units in the 10,000 to 20,000 baht range available for rent. The terminus of the BTS and MRT are both located in Chatuchak, making it easy to travel to any part of the city served by public transport. Just be aware that you’ll need to spend 20 minutes or longer on the train to get to any of Bangkok’s central neighbourhoods. More popular with locals than expats, the Ratchada/Ladprao area is a great place to find cheap and convenient accommodation. Condos and apartments in this area are mostly aimed at the Thai middle class, making them more affordable than similar options in Upper Sukhumvit. The Ratchada/Ladprao area is served by the Bangkok MRT, making it easy to get to most parts of the city in 20-30 minutes. As this is a very large area, it’s very important to choose a condo or apartment that’s close to the BTS to avoid a long, hot and uncomfortable commute. The area between Huay Khwang and Sutthisan MRT stations is a convenient place to live. It’s home to several shopping malls, such as The Esplanade and The Street, and has a reasonable selection of cheap apartments and mid-priced condominium buildings. Because this area is more popular with middle class Thais than expats, you won’t find as many international restaurants or bars here as you would along Sukhumvit Road. However, the area’s two malls offer a good choice of international dining and shopping options. Most apartment and condo buildings in the Huay Khwang and Sutthisan area are located five to 10 minutes from the MRT. As always, the further you get away from the MRT, the less you’ll pay for accommodation and the longer you’ll need to spend commuting each day. Ladprao (or Lat Phrao) is a large commercial and residential area in the north of Bangkok. As a middle class Thai area, Ladprao has a good selection of cheap to mid-priced apartments and condos, as well as several large shopping malls. Since Ladprao is a huge area, it’s important to choose an apartment or condo close to the MRT line. There are three stations in the Ladprao area — Ratchadaphisek, Lat Phrao and Phahon Yothin — all of which are about 20-25 minutes from Bangkok’s central districts. Like On Nut, Ladprao offers a good mix of convenience and affordability. Just be aware that you will need to spend 20-25 minutes on public transportation or 30+ minutes in a taxi to reach most of Bangkok’s central shopping and nightlife areas. The area around Rama III Road is close to Silom but less served by public transportation, giving it cheaper rental prices and a quieter atmosphere. With its own mall (Central Rama 3), Rama III can be a pleasant place to stay if you don’t mind a short commute to reach public transportation. The biggest advantage of Rama III as a place to live is its cost. Apartments here cost about two thirds as much as similar units a mile or two away in the Silom/Sathorn business area, making it a great choice if you’re on a strict budget. The only real downside of the Rama III area is the lack of public transportation. While the BRT system connects some parts of the area with the BTS, you’ll need to catch taxis or motorcycle taxis to get around if you’re further than 10 minutes away from a BRT stop. 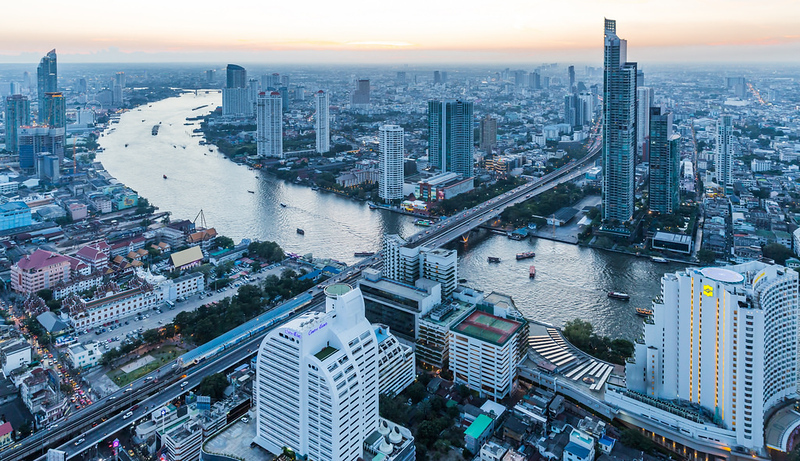 Bangkok’s Riverside area, which covers several neighbourhoods around Saphan Thaksin and Krung Thonburi BTS stations, offers beautiful views and a good selection of upmarket condos and apartments. If you have a relatively high budget, you’ll have access to buildings like The River, which offers panoramic views of the Chao Phraya River and Bangkok’s Silom/Sathorn CBD. There’s also a reasonable selection of mid-priced apartments and condos in this area. From areas like Krung Thonburi and Saphan Thaksin, you’ll have good access to a variety of supermarkets and department stores, as well as upmarket cafés, restaurants and bars at the numerous luxury hotels located alongside the Chao Phraya River. The biggest downside of the Riverside area is the distance you’ll need to travel to reach areas like Siam and Sukhumvit. Although the BTS is right nearby, it’s a good 15 minute journey to get to Siam BTS station, and a 25+ minute trip to reach Asok and other parts of Sukhumvit.